Halifax put themselves firmly back in the hunt for a top four Championship finish with a crushing 37-0 win over Featherstone in the final act of the Summer Bash weekend. At a sun drenched Bloomfield Road, Richard Marshall’s side led 27-0 at the break and never looked like making a hash of the second half against the competition’s best defence. Fax, arguably in season’s best form both with and without the ball, remain sixth on the ladder but are now level on 18 points with fourth-placed Bradford and fifth-placed Rovers. Halifax had taken a fifth-minute lead when Cook Islands prop Adam Tangata stormed over from the perfectly weight short pass from fellow front rower Mitch Cahalane, Steve Tyrer tapping over the conversion from the left of the posts. Marshall’s side could not deal with the restart, putting themselves under pressure, but the defence held firm and then turned into startling attack, half back Gareth Moore darting out of the line and picking off an Anthony Thackeray pass to go the length of the field to touch down. 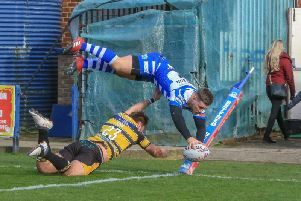 Tyrer was again on target as Halifax went 12-0 ahead and then 13-0 up after Moore chipped over a drop goal on the half hour. With Rovers’ error rate steadily climbing, Fax hit them for two more tries before the break. Matt Sarsfield got the first from a Ben Johnston pass, Tyrer again on target, and with Murrell bossing the game from dummy half, Johnston grabbed his side’s fourth with a fleetfooted finish on the right. Tyrer added the conversion for a 25-0 lead coming into half time, before Johnston won a penalty on the final play to give the centre an easy chance for a 27-0 interval lead. Halifax should have started the second half with a penalty try, Misi Taulapapa being sin binned after kicking the ball out of Ben Heaton’s grasp but no points being awarded. But with Murrell and his forwards dominant, more points were inevitable. James Saltonstall got the first, skipping over in the corner after some super crossfield passing, Tyrer registering his only miss of the day from the sideline. Tyrer did hit the mark from the other side of the field though, the centre converting after taking a short ball from the ever-impressive Dane Manning to complete the scoring.